These would enhance any piece of furniture. 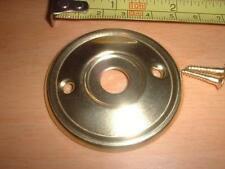 They have a small flower and scrolls above and below the key hole. Pre drilled top and bottom. You are bidding on a LOVELY lot of 23 Vintage French Skeleton Keys! These lovely keys are made from steel / iron(? )/Brass measure between 3 and 4 1/4" - they lovely vintage condition with a beautiful shabby aged rusty patina to some, whilst others are shiny- incredibly decorative and displayable! Some of the key barrels have the most AMAZING profiles - check out the pictures! Please study photos to see all the lovely details- they are a lovely set, and an absolute must have for any collector and those with a lovely house in which to display them!! HAPPY BIDDING! I have lots of keys that I will be listing - happy to combine postage where weight limits allow! SET N.
You are bidding on a LOVELY lot of 22 Vintage French Skeleton Keys! These lovely keys are made from steel / iron(? )/Brass measure between 3 and 4 1/2" - they are in lovely vintage condition with a beautiful shabby aged rusty patina to some, whilst others are shiny- incredibly decorative and displayable! Some of the key barrels have the most AMAZING profiles - check out the pictures! Please study photos to see all the lovely details- they are a lovely set, and an absolute must have for any collector and those with a lovely house in which to display them!! HAPPY BIDDING! I have lots of keys that I will be listing - happy to combine postage where weight limits allow! 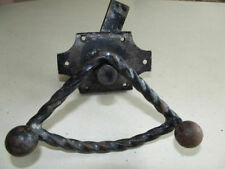 SET M.
You are bidding on a LOVELY lot of 22 Vintage French Skeleton Keys! These lovely keys are made from steel / iron(?) measure between 3 and 4" - they are in lovely vintage condition with a beautiful shabby aged rusty patina to some, whilst others are shiny- incredibly decorative and displayable! Some of the key barrels have the most AMAZING profiles - check out the pictures! Please study photos to see all the lovely details- they are a lovely set, and an absolute must have for any collector and those with a lovely house in which to display them!! HAPPY BIDDING! I have lots of keys that I will be listing - happy to combine postage where weight limits allow! SET O. 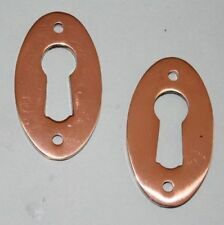 A set of 8 French Escutcheon. They will make any cupboard door look great with their cockerel style design. You are bidding on a LOVELY lot of 22 Vintage French Skeleton Keys! These lovely keys are made from steel / iron(? )/Brass measure between 3 and 4 1/2" - they are in lovely vintage condition with a beautiful shabby aged rusty patina to some, whilst others are shiny- incredibly decorative and displayable! Some of the key barrels have the most AMAZING profiles - check out the pictures! Please study photos to see all the lovely details- they are a lovely set, and an absolute must have for any collector and those with a lovely house in which to display them!! HAPPY BIDDING! I have lots of keys that I will be listing - happy to combine postage where weight limits allow! SET P.
You are bidding on a LOVELY mixed set of 5 vintage French Keys!! 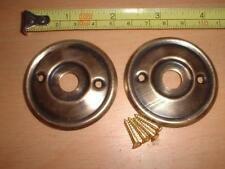 These lovely keys are made from steel / iron / Brass with the largest measuring 3 1/2" and the smallest 1 1/2". They are in good vintage condition and are incredibly decorative and displayable! 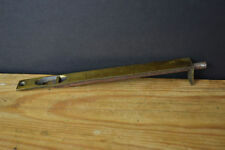 My favourites are the brass folding bow key and the chateau key with it's unusual bit profile. Please study photos to see all the lovely details- they are a lovely lot, and an absolute must have for any collector and those with a lovely house in which to display them!! HAPPY BIDDING! I have lots of keys that I will be listing - happy to combine postage where weight limits allow!. Ready to fit. We like to both give positive feed back and receive it.